Beaudry Hometown Insurance was in the process of being passed down from one generation to the next—the third, to be exact. With that transition, the company was in need of a rebrand: one that would identify what set it apart from its competitors and communicate that reality visually to its insureds. It’s a common mistake to think branding is a simple one-step process of designing a logo graphic. Before anything visual is developed, it’s critical for a company to thoroughly know and understand who they are and why they do what they do. For this reason, I walk my clients through a thorough process of soul-searching to define a “Why” statement, core beliefs and values before I begin designing logos and brand guidelines. A Why statement proclaims an entity’s purpose. It quickly says what they do, who they do it for, and what they want to achieve. Accompanying a Why statement are core beliefs and values. As the name suggests, a core belief is a passionate declaration of the beliefs that are core to who the company is. Core values are driving principles that stem from those beliefs, which serve as clear governing standards behind the organization’s culture. Using innovative technology and open communication, Beaudry Hometown Insurance matches Minnesotans with the best possible insurance plans to fit their needs, through a fun, easy, and personal experience. Insurance should be there when you need it. Telling the truth is more important than selling a product. Understanding Beaudry’s beliefs allowed me to define the brand’s voice. Every brand has a certain personality. Apple is a rebel, Taco Bell a jester, REI an outdoors-lover. Beaudry, we determined, is homegrown. Beaudry Hometown Insurance is proud to be a family-owned company that has spanned three generations, passing down important values like honesty to each. They are also proud of their Minnesotan heritage, and have community at their core. Insurance is about people. It isn’t always an enjoyable topic to talk about, but everyone needs it, so the company strives to make the process as fun, relatable, personal, and transparent as possible. Beaudry Hometown Insurance has a rebellious vein, pushing the boundaries on what is expected of the industry in hopes of breaking the stereotype of a stale and sterile insurance agency. They are 100% human, and 100% okay with that; because honesty begets honesty. By letting themselves be raw and real, long-lasting bonds of trust can be formed, and when insureds feel like they can be honest with their insurance agents, the company is better equipped to help them. The team at Beaudry Hometown Insurance is constantly seeking answers to new questions and adapting to the times by utilizing modern technology in their processes. After determining Beaudry’s beliefs, the next step was to find a way to visually represent them. The process involved lots of brainstorming of concepts, revisions of logos, and development of brand elements such as fonts and colors. In the end, they all came together to form a cohesive, replicable brand image. The Beaudry brand should evoke feelings of safety, comfort, familiarity, security, fun, excitement, freedom, nostalgia, and a hint of uncompromising attitude. The overall visual feel should be youthful and edgy, while at the same time homey and old-fashioned. To accomplish this, the brand utilizes the visual of woodgrain. Woodgrain has layers and history, knots and imperfections, and every slice of it is unique. Wood doesn’t conform to a mold. The curves and edges of its layers appear to be in constant motion as it grows and adapts to its environment over long periods of time. Its grain is intricate—everything is in some way connected—and, despite being somewhat complicated, that makes it strong. The brand image uses colors that are dark, warm, rich, and muted to evoke a cabin-like feel, familiar to Minnesotan culture. The styles are reminiscent of a beer label: relatable and vintage. Little imperfections and rough edges give the brand a raw feel while splashes of brighter color add fun and rebelliousness to the mix. The logo is a B with a subtle H and I woven into it, the initials for Beaudry Hometown Insurance. Its minimal appearance is appealing to a younger audience to break industry stereotypes, its solid angles speak to the company’s long-lasting stability, and its interlocking lines reference accessibility, utilization of technology for communication, movement and growth. The three “i”s represent three generations of business. Fonts have feelings, too. 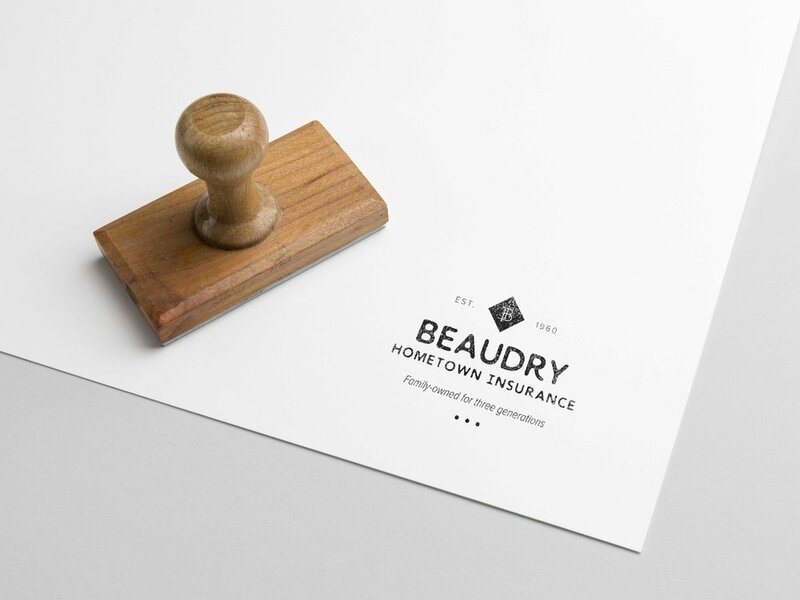 The fonts selected convey the complex personality of Beaudry Hometown Insurance. Wayward is human, personal, fun, honest, alive, growing, curious, young, flexible, gentle, and homey; while Proxima Nova is stable, trustworthy, dependable, grounded, long-lasting, historic, safe, and connected. The primary color pops used to set Beaudry Hometown Insurance apart are a warm, inviting yellow to communicate lighthearted fun, a soothing blue green to reference financial stability and incite a sense of comfort, plus a rich purplish red for a hint of edge and rebelliousness. All are slightly muted and earthy in tone to keep with the homey, woodsy feel of the brand. A brand is more than a logo—it’s a promise. It puts on paper who and why you are, and what your customers or clients can expect from you. What Beaudry Hometown Insurance received was more than a piece of clip art. 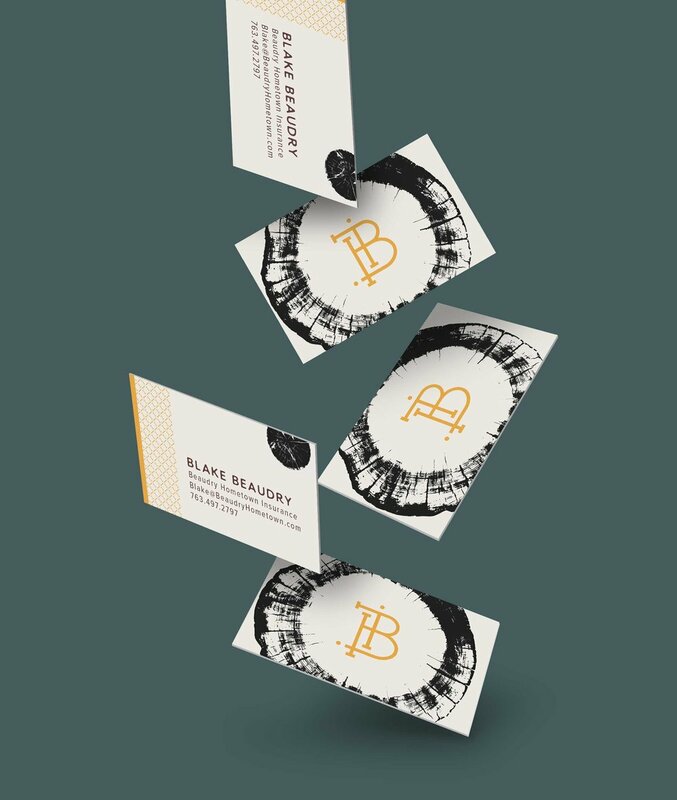 They got clarity, illustrated in a brand guide that will allow them to shape their work culture and streamline their promotional materials, even as new employees come on board, and whether they create marketing materials in-house or outsource to other designers. It’s been a pleasure to work with such a family-oriented, down-to-earth company, and I’m grateful to have had the opportunity to set Beaudry Hometown Insurance up for long-term success! If your company or startup is in need of a solid brand, or brand makeover, don’t settle for a brand-aid! Shoot me an email at info@rebeccaloomis.com.